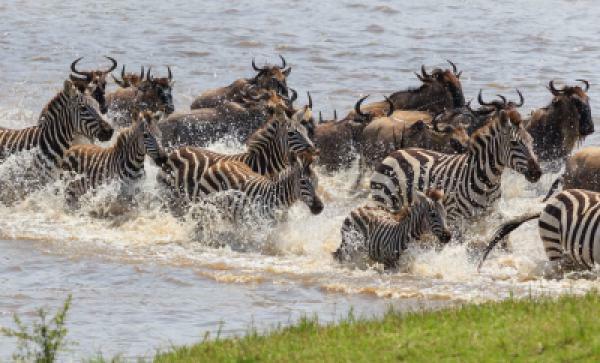 In the African savannah, Zebras will rely on their Wildebeest friends to leap into the river first to test out the treacherous crossing. If no troublesome crocs emerge, they know it’s safe to make the crossing. In return, Zebras munch on the longer grasses to encourage new growth that is more suitable for Wildebeest to eat. They’ve reached an understanding and know how to support each other for mutual benefit. Such collaboration seems difficult to achieve in organisations; cross-team working is one of the lowest scoring areas in employee surveys. To quickly establish a basis for cross-team working, why not try running ‘home and away’ sessions? You can run one big event, or a series of smaller events (provided at least two people from each team or department attend). One person from each team stands at their ‘station’, whilst the other team member works around the other stations. At each station, you share what your team does, pressure points (what you need from other teams) and how you can support other teams. By the time you have circulated around all stations, you’ll have a good idea of what other teams do and how you can improve cross-team working. These insights can then be shared and developed in team meetings. Go a step further and set it up speed dating style, with a bell to keep people moving round at pace! One of the common suggestions put forward in employee focus groups is to make sure that intranet contact lists are up-to-date and that photos of employees are next to their names. This makes it much easier for employees to find out who they need to talk and they can literally put a face to the name. When employees use only email and do not know who they are talking to, they tend to be more obstructive and “pass the buck” on requests for other teams. If personal relationships can be established, people are much more motivated to be supportive. For new starters, remember to include introductions to other teams so that right from the start they have had visibility of people across the organisation. Encourage employees to suggest fun events that help to maintain cross-team relationships. These can be formal setups, such as employee forums or quarterly company events. Or they can be smaller and informal, for example, fortnightly group coffee breaks when people can wander over to one part of an office for a coffee, a biscuit (or healthy snack) and a chat with colleagues/leaders. And while you’re booking all this in, perhaps book yourself a safari trip too!